This blogsite is developed by David V. Black in order to share resources, lesson plans, ideas, and information for teachers who are interested in bringing space science education into their classrooms, no matter what subjects they teach. David Black has been deeply involved in astronomy education for the last 13 years as he has participated in numerous NASA professional development programs as both a participant and a presenter. In 1998 he was selected for the NEWMAST program (NASA Educator Workshops for Mathematics and Science Teachers) at the Jet Propulsion Laboratory (JPL) in Pasadena, CA. He spent two weeks along with 24 other teachers from around the country learning about upcoming and current NASA space probe missions, touring the labs, meeting project scientists, and practicing lesson plans and educational materials. He also had the chance to do some astrophotography using a 24 inch telescope at Mt. Wilson Observatory. This opportunity was such a life-changing experience that he determined to stay involved in NASA educational programs as much as possible. 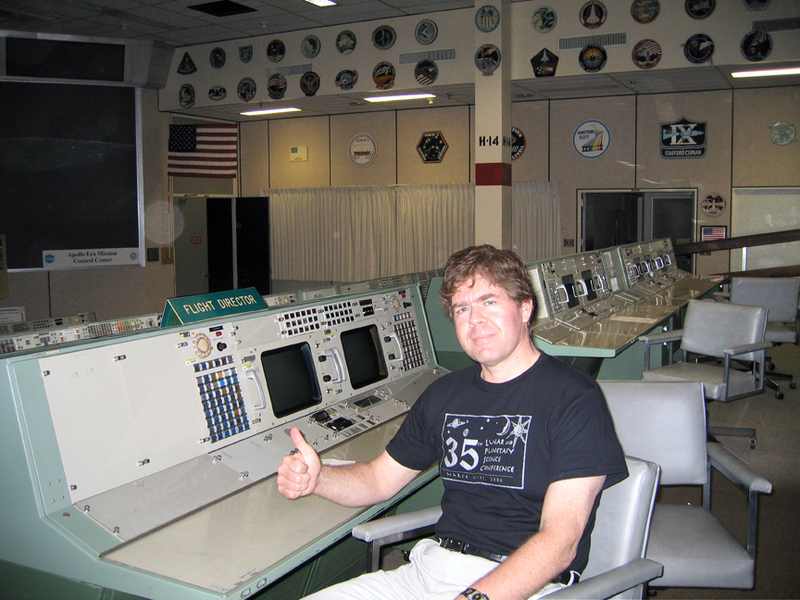 David Black at Johnson Space Center, 2004. I’m sitting in the Flight Director’s chair. 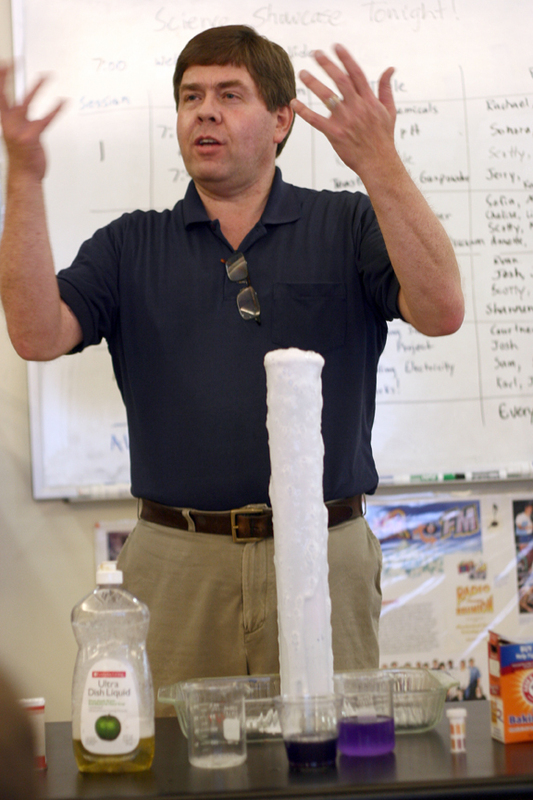 In 2000, he was selected as a NASA/JPL Solar System Educator. He returned to JPL each summer to receive additional training from mission Education and Public Outreach (EPO) coordinators. He then turned around and presented these materials at conferences, workshops, and star shows in Utah. Some of the missions he learned about included the Mars Exploration Rovers, Mars 2001 Odyssey, Stardust, Deep Impact, Cassini, Genesis, and the Deep Space Network. Over four years, he helped to train over 500 other teachers on NASA space missions. As part of this program, David also traveled to Cape Canaveral for the launch of the Mars 2001 Odyssey space probe. In 2002 he became the Educator Facilitator for the NEWMAST program at JPL, which in 2003 was renamed the NASA Explorer Schools program (NES). His responsibilities were to help plan the summer workshops, to coordinate travel, hotel, meals, and transportation, and to plan the schedule and help present during the workshops, along with EPO personnel from JPL. He did this for the workshops in 2002, 2003, and 2004. He has visited the Deep Space Network antennas at Goldstone, and also visited six of the ten NASA field centers, including JPL, Kennedy Space Center, Johnson Space Center, Dryden Flight Research Center/Aircraft Operations Facility, Stennis Space Center, and Goddard Space Flight Center. David brought back what he learned to his own classroom, teaching students about space missions and incorporating NASA science and technology into his science and multimedia classes. 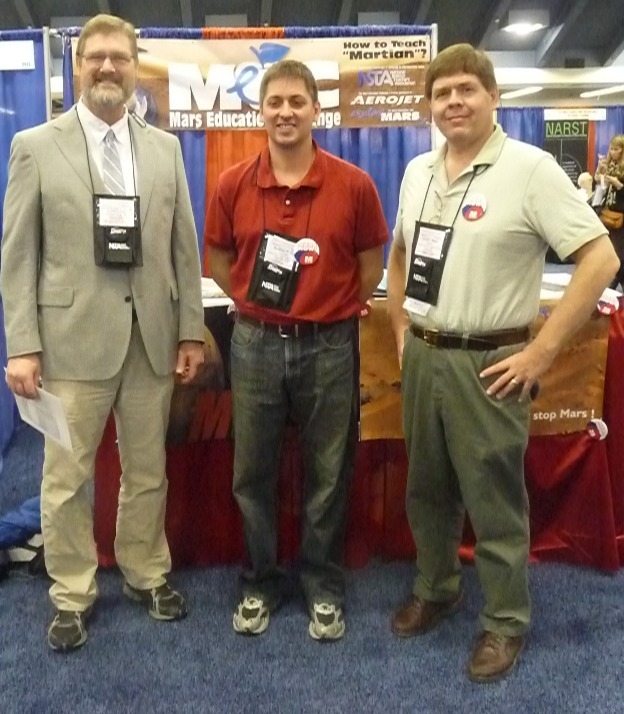 In 2003, his students were chosen as a premiere team for the Mars Exploration Student Data Team (MESDT) program. They accessed data from orbiting Mars probes to predict the weather on the surface, including dust storms, which might interfere with ground operations of the Mars Exploration Rovers. Four of his students traveled to Arizona State University in April, 2004 to present their project, a 3D multimedia presentation on Mars space probes, to a symposium of MESDT schools and students. David also traveled to the 35th Annual Lunar and Planetary Science conference in Houston to present how his students were using authentic Mars 3D data to create animations and videos. In 2011, David won third place nationwide in the first annual Mars Education Challenge, sponsored by NSTA and Explore Mars, Inc. He received an award at the NSTA national conference in San Francisco from Bill Nye, the Executive Director of the Planetary Society, one of the sponsors of the competition. His students developed 3D animations showing the origin and features of the Moon for the Center for Lunar Origin and Evolution (CLOE) in Boulder, CO, which is part of the NASA Lunar Science Institute. His astrobiology students also completed a series of audio podcasts for the “365 Days of Astronomy” website in December, 2011. In 2013, they filmed and edited a video lesson plan on how to find the distance to stars using trigonometric parallax. The video is now part of the MIT BLOSSOMS project. His students were selected to be part of NITARP, the NASA/IPAC Teacher Archive Research Project. They traveled to Caltech in the summer of 2014 and studied Infrared data from the WISE mission to determine if lithium-rich giant stars may be consuming their own planets. They presented a poster of their research at the American Astronomical Society conference in Seattle, Washington in January 2015. David’s students also were chosen as MESSENGER Student Investigators and worked with scientists on the MESSENGER space probe team to analyze data from Mercury. 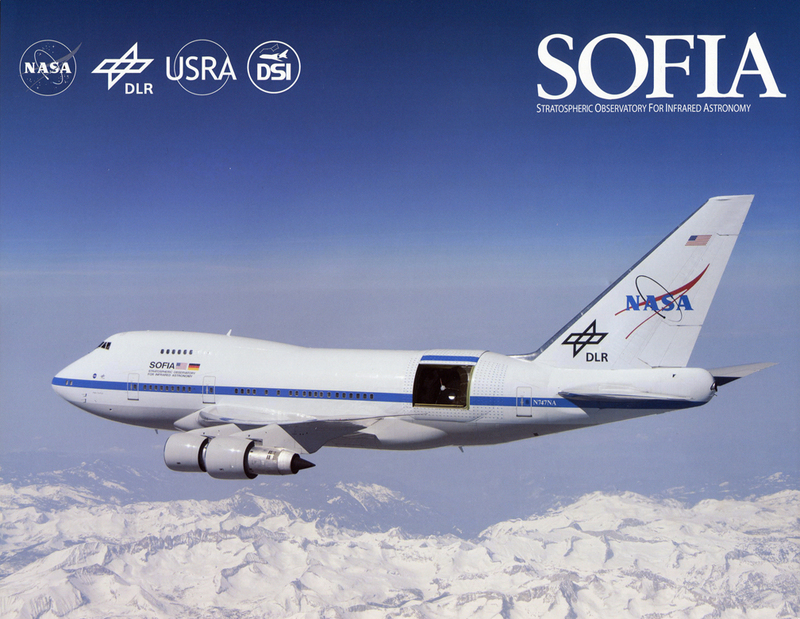 In January, 2012 David was chosen as a SOFIA Airborne Astronomy Ambassador by NASA. He flew aboard the Stratospheric Observatory for Infrared Astronomy (SOFIA) in June, 2013 and videotaped his experience. His students have created 3D animations of SOFIA and are now editing the footage into a 30-minute video for YouTube. David has presented his experiences flying on SOFIA at NSTA conferences. In 2015, he became a MAVEN Education Ambassador and received training at Goddard Space Flight Center in Greenbelt, Maryland. He learned about the MAVEN mission to explore the atmosphere of Mars. In 2016, he planned and directed a student expedition to aerospace and energy production companies in Utah, Nevada, and California. 17 students and two teachers participated and visited such places as the Intermountain Power Project, the University of Utah’s Cosmic Ray facility, the Ivanpah Solar Thermal Project, the Deep Space Network near Goldstone, the Jet Propulsion Laboratory, the Stratospheric Observatory for Infrared Astronomy (SOFIA), and the California Science Center. In 2016-17, David taught at American Academy of Innovation in Daybreak, Utah where he managed the school’s first school-wide Project Based Learning (PBL) experience. 13 student teams proposed projects on the theme of Mars Exploration, and David and student leaders traveled to Houston to present their projects at a poster session of the Lunar and Planetary Science Conference. During the summer of 2017, David was chosen as an educator ambassador for the U.S. State Department as part of their Fulbright Teachers for Global Classrooms program. He taught classes in chemistry, astronomy, and technology at a small rural high school near Banjarmasin in southern Borneo, Indonesia and learned about the Indonesian education system. Presenting a professional development workshop for teachers in the area of Banjarmasin in southern Borneo, Indonesia in 2017. David is a frequent presenter at state and national science and technology conferences and represented charter, private, on-line, and home schools on the Utah Science Teachers Association board. David also creates educational videos and lesson plans on the history of chemistry and chemistry education, which are found at his other blog site: elementsunearthed.com. He has received several grants from the American Chemical Society and elsewhere to explore the history of mining throughout the western United States and soil contamination around mine dumps in these mining districts.